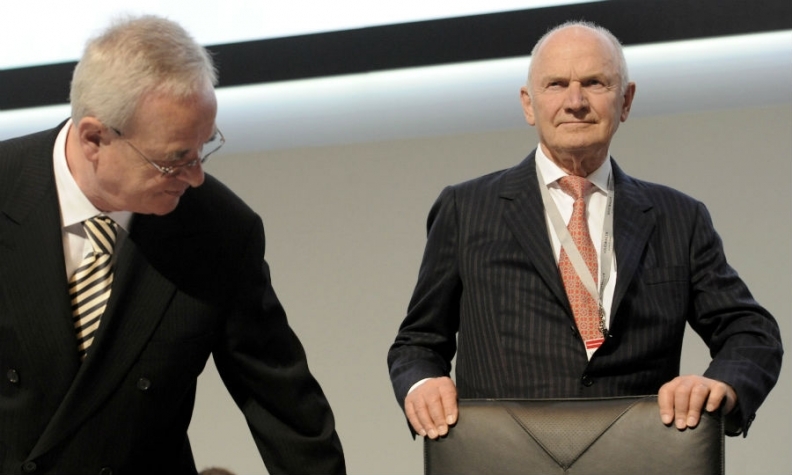 Piech, right, intervened to prevent Winterkorn, left, becoming VW chairman, reports said. FRANKFURT (Reuters) -- Former Volkswagen chairman Ferdinand Piech prevented CEO Martin Winterkorn from fulfilling his ambition to become chairman, showing the patriarch's continuing influence behind the scenes, two respected German publications reported. The Porsche-Piech clan, which controls Volkswagen's 51 percent shareholder Porsche SE, had agreed to propose Winterkorn as chairman before Piech's intervention, weekly magazine Spiegel and the Frankfurter Allgemeine Sonntagszeitung said. Volkswagen announced last week that its Chief Financial Officer Hans Dieter Poetsch -- seen as a peacemaker -- would step into Piech's shoes as chairman, while Winterkorn's CEO contract was extended for two years. In response to the Spiegel and the Frankfurter Allgemeine Sonntagszeitung reports, Volkswagen said its executive committee had already decided in April to propose the extension to Winterkorn's contract, and declined to comment further on what it termed "speculation." Porsche SE, contacted for a comment from Piech, referred to its statement from Thursday, in which it said Poetsch had the "unequivocal support" of its entire supervisory board, which includes Piech. It declined to comment further. Piech, the 78-year-old grandson of the inventor of the Volkswagen Beetle, was forced to quit as chairman in April after being thwarted in an attempt to discredit Winterkorn. His departure ended an era at the German carmaker. Under Piech's chairmanship, Volkswagen built an empire spanning fuel-efficient city cars to 40-tonne trucks. Winterkorn is now promising a new structure it is hoped will help VW improve profitability and address troublespots.